The Maestro M5 redefines cinematic enjoyment for the home cinema purest. AudioControl’s next generation preamp processor supports Dolby Atmos®, DTS:XTM, HDMI 2.0a, HDCP 2.2, Dolby VisionTM and HDR playback. Behind the sleek, Espresso Black brushed aluminum front panel, the Maestro M5 houses the very latest in audio and video processing technology ensuring no sonic detail is missed. The Maestro M5 paired with AudioControl’s legendary Savoy G3 Theater Amplifier or the Pantages G3 Theater Amplifier powering the worlds most demanding speakers will elevate the home theater experience to a new level of immersion, power and realism. Test drive a Maestro M5 today and experience yourself what you’ve been missing in your home theater. Dolby Atmos® for the home represents every sound in the original cinema mix as an audio object. Extensions to the Dolby AudioTM CODECs, along with an advanced scalable algorithm, allow Dolby Atmos to be delivered via Blu-ray Disc and streaming media. AudioControl's Maestro M9, M5 and Concert AVR-9 and AVR-7 adapt the cinema experience to your home theater using up to 12 channels (for configurations above 8 channels, additional power amplification is required), recreating the original artistic concept. 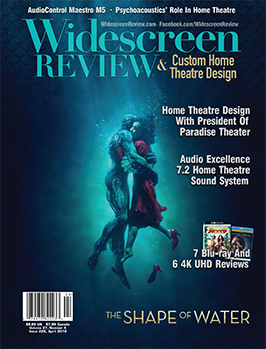 Creating a lifelike audio experience in a cinema or at home has always presented a challenge. DTS:X makes sound move around you like it would in real life - without requiring specific speakers or custom configurations. Moviemakers can now immerse you deeper in the experience than ever before. The Maestro M9, M5 and Concert AVR-9 and AVR-7 support DTS:X and will bring the mix designed for movie theaters into your home. The Maestro M9, M5 and Concert AVR-9 and AVR-7 use a built in proprietary automatic loudspeaker setup function from Dirac Research. Using a PC/MAC based application, Dirac Live® determines the essential speaker settings for all the speakers in your system. It also calculates room equalization (Room EQ) filter values to remove some of the worst effects of resonant frequencies in the listening room. The result is improved staging, better clarity and intelligibility in music and vocals and deeper, tighter bass without resonance. Dolby Vision is advanced high dynamic range (HDR). A new capability in today's cutting-edge televisions, HDR complements HD and UHD (4K) displays. Rather than increasing resolution, as 4K does, HDR focuses on the brightness, contrast, and color of the image. While these benefits have been talked about in the past, one look at a new HDR display reveals a powerfully enhanced TV image.The Maestro M9, M5 and Concert AVR-9 and AVR-7 fully support playback of Dolby Vision content. Maestro M9, M5 and Concert AVR-9 and AVR-7 are ready for the next generation of digital media entertainment. They support HDMI 2.0 for 4K 50/60 Hz playback and HDCP 2.2, including HDR playback support. Current standard definition and 1080p content benefit from beautiful upscaling to 4k Ultra HD. Featuring 7 HDMI inputs and 3 HDMI outputs, the Maestro M9, M5 and Concert AVR-9 and AVR-7 support multiple displays in zone 1 and full HD video and audio for the second zone.